The Garden Route is a 300 km (190 mi) stretch of the south-western coast of South Africa which extends from Mossel Bay in the Western Cape to the Storms River in the Eastern Cape. The name comes from the verdant and ecologically diverse vegetation encountered here and the numerous lagoons and lakes dotted along the coast. It has an oceanic climate, with mild to warm summers, and mild to cool winters. 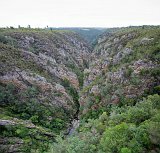 The Route is sandwiched between the Outeniqua and Tsitsikamma Mountains and the Indian Ocean.